As someone whose blog is titled aNadventures, I just HAD to take part in this week’s photo challenge. So here I am, sharing a picture of an alley in Istanbul, where my Turkey adventure started a little over two years ago. This city is full of history. Each corner tells its own story. 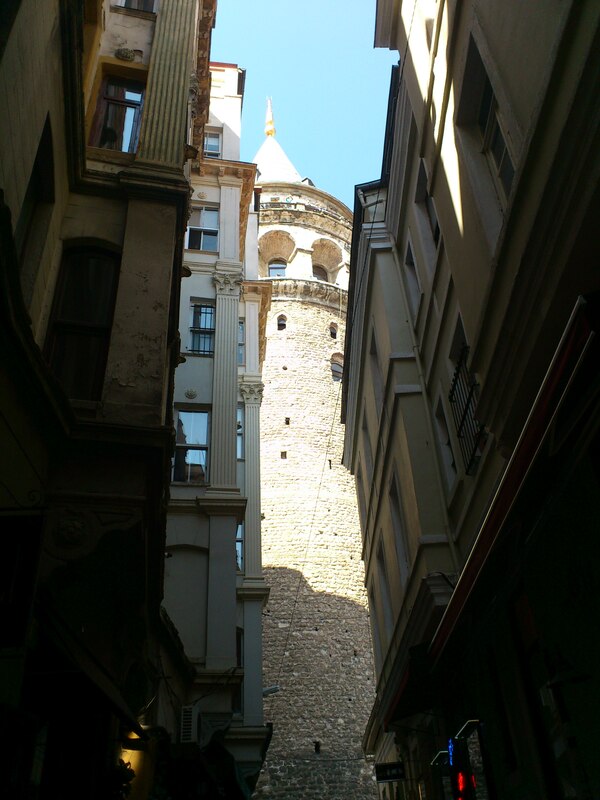 Do you see the Galata Tower (Galata Kulesi) amid the old buildings in the alley? It’s much smaller than it seems. Yet, it was the city’s tallest building when it was constructed in 1348 in the course of the expansion of the Genoese colony in Constantinople. This tower was used for spotting fires; it witnessed several restorations and today represents one of Istanbul’s main touristic sites. It provides a marvelous view of the Bosporus, the Golden Horn and the giant city’s historic peninsula. My personal “Galata Tower adventure” consisted in pretending to be Turkish upon buying an entry ticket when I visited the city for a second time with my family in September 2013. The entrance fee is less expensive for Turkish citizens. It somehow worked. Istanbul is an interesting place.